We’ve all been there. Between hectic work days, family commitments, and the constant distractions of social media, we have little time to focus on ourselves. But that time is important, maybe more important than ever. If you want to be your best self—for you and everyone else in your life—carving out time for self-care is critical. Self-care can be built into little moments that are just for you, like your daily skin care ritual. Those few minutes spent with natural products that help reveal your radiance will leave you feeling calm, refreshed and most of all, confident. It’s time to transform your skin care routine into a relaxing, beautiful ritual that leaves you ready to take on the world. YOU’RE UNIQUE. YOUR SKIN CARE SHOULD BE, TOO. First up is finding the right products. 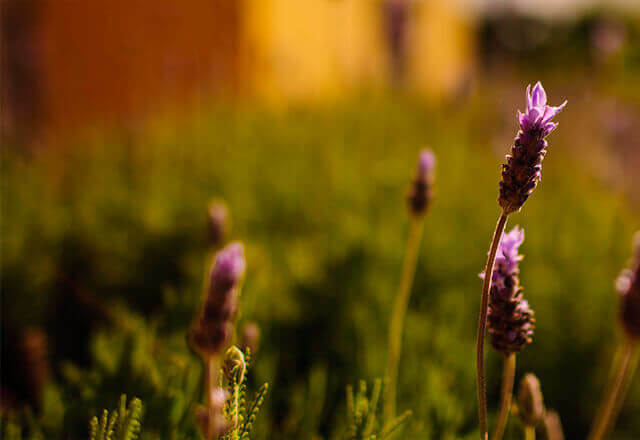 Indulge in products that come from nature, and are meant to nourish and protect your skin. And of course, everyone’s skin is different. 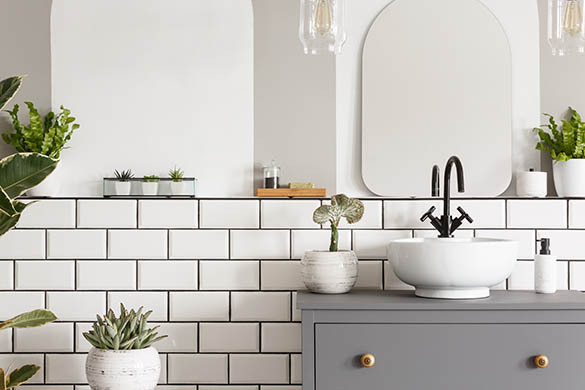 A tool like the Burt’s Regimen Builder can help you find the exact right products for you. Not every morning has to be a hectic rush to get out the door. It’s worth it to set the alarm a few minutes early to get some time for yourself and get energized for the day ahead. Start with a few sun salutations. Then it’s time for your morning skin care ritual. Get that #wokeupthisway glow with Burt’s Skin Nourishment Gentle Foaming Cleanser, massaging skin as your cleanse. Follow it up with a cream developed specifically for the delicate eye area, like Burt’s Sensitive Skin Eye Cream. And don’t forget the SPF, even on a cloudy day. Luckily, our Skin Nourishment Day Lotion with SPF 15 has you covered. Consider yourself ready to face the day. After a long day, it’s time to rest and recharge with a good nighttime ritual. Turn on the blue screen filter on your phone. Turn off the TV. Escape from it all with a good novel. And right before bed, it’s time to give yourself the gift of great skin care. First, take off all traces of a crazy day (oh, and all your makeup) with our luxurious, gentle Facial Cleansing Oil. Decompress with a facial massage while you’re at it, relaxing the muscles and improving circulation. Slow it down and prepare your skin for a good rest with Burt’s Sensitive Skin Night Cream. And smooth lips with your favorite flavor of Burt’s lip balm or our Overnight Intensive Lip Treatment. Women everywhere have declared Sunday night #SelfCareSunday. And it’s clear why. It’s a great time hit the pause button and give your skin—and yourself—a little extra TLC. Try a Detoxifying Charcoal Sheet Mask, or a Hydrating Sheet Mask for extra moisture. A luxurious lip mask keeps your kisser soft and supple. Facing cold, drying winter weather? Add this to your ritual: Burt’s Hand Salve with cotton gloves, and luxurious Coconut Foot Crème, worn with socks to let all that good, natural moisture soak in. What’s your Sunday night Burt’s ritual? Share it on our Instagram page with #selfcaresundays and #selfcarewithburts. Need some simple self-care ideas? 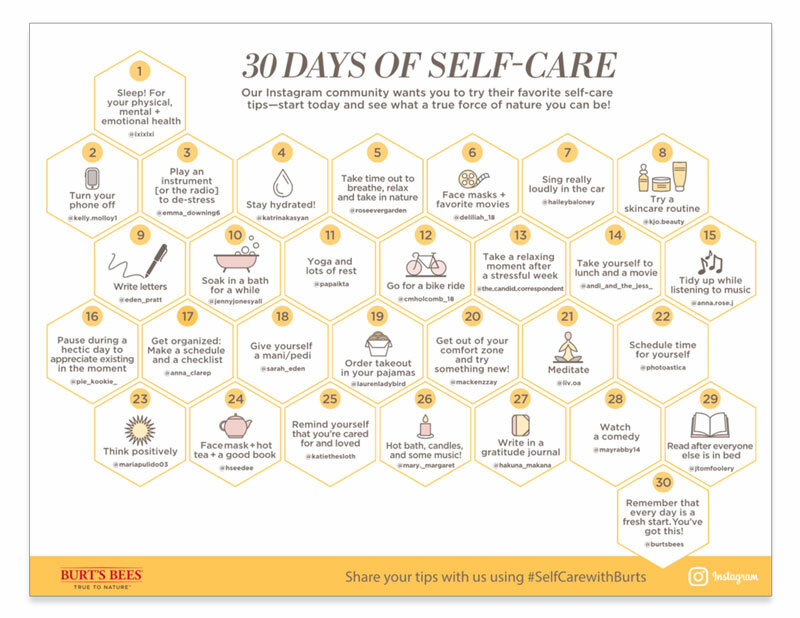 Get our 30 Days of Self-Care calendar featuring tips from our Instagram community! Little rituals like these can go a long way toward building self-care into every single day. The key to being an amazing force of nature? Giving yourself the time you need to gather your strength and your confidence—so you can give it freely to others.